Keep a calendar of class times, study times, tutoring sessions, and meetings with advisors or instructors and any other commitments you have. Use Google Calendar and sync it to your phone. Planning and managing your time will reduce stress and help you accomplish more. The ASC has printable calendars for your use. Stop by or visit our website! Overwhelmed by finals? College Info Geek has gathered resources that may be helpful as you prepare for the end of the semester. 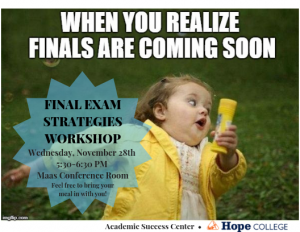 The Ultimate Guide for Studying for Final Exams includes links with useful tips and tricks on everything from breaking through a lack of motivation for studying to maintaining focus and concentration to test-taking strategies for the day of the exam. Check it out and good luck!